A stray shower or thunderstorm is possible early. Some clouds this evening will give way to mainly clear skies overnight. Low 56F. Winds E at 10 to 15 mph..
A stray shower or thunderstorm is possible early. Some clouds this evening will give way to mainly clear skies overnight. Low 56F. Winds E at 10 to 15 mph. 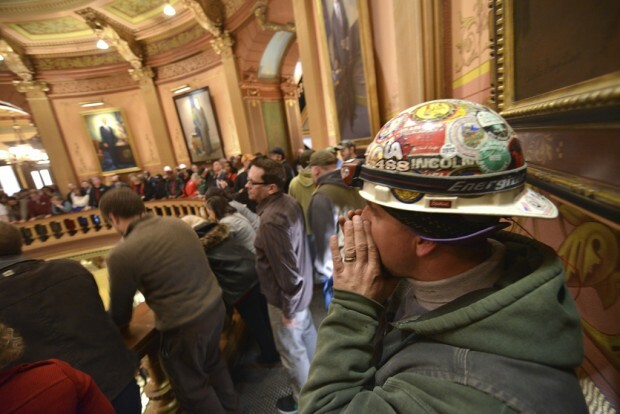 Michigan union members demonstrate loudly at the Capitol in Lansing as legislators consider "right-to-work" legislation. Hundreds of labor supporters packed the rotunda area Wednesday, blowing whistles and chanting slogans. State police and Capitol security officers kept a lid on the situation, and the protest didn't disrupt work in the House or Senate. The Tucson Metro Chamber of Commerce, Hispanic Chamber of Commerce and Tucson Regional Economic Opportunities Inc. have joined a statewide coalition in calling for immigration reform. The Real Arizona coalition consists of more than 40 civil rights, business, government and religious groups. "We've enjoyed a long history of cooperation, cross-border trade and economic opportunity with the citizens of Sonora," said Bruce Dusenberry, CEO of Horizon Moving Systems, board chair of the Tucson metro chamber and board member of TREO. "Sadly, in recent years we have also directly experienced the harsh burdens of both a failed U.S. immigration policy and Arizona's damaged reputation in its efforts to respond," Dusenberry said Wednesday. "We must embrace a reasoned approach to restoring our productive cultural and business ties to Mexico and the rest of the world." The coalition is calling for secured borders, bureaucratic reforms and lobbying efforts, among other steps. Go online to therealarizona.org to follow it. Experts say Arizona is on the path to full economic recovery and may get there in about three years. Economists speaking at an event in Phoenix Wednesday said Arizona ranked fifth among states for job growth as of September, and Phoenix was fourth among large metro areas. They said Arizona is expected to add 60,000 jobs next year, led by professional and business services, retail, hospitality and health care. They also said Arizona may see a 2.5 percent growth in its employment rate next year. And they predicted that the state's unemployment rate will dip below 8 percent in 2013. About 1,000 people attended Wednesday's 49th annual economic forecast luncheon. The event was co-sponsored by Arizona State University's W.P. Carey School of Business and JPMorgan Chase. Citigroup said Wednesday that it will cut 11,000 jobs, a bold early move by new CEO Michael Corbat. The cuts amount to about 4 percent of Citi's workforce. Most of them, about 6,200 jobs, will come from Citi's consumer banking unit, which handles everyday functions like branches and checking accounts. Citi said it will sell or scale back consumer operations in Pakistan, Paraguay, Romania, Turkey and Uruguay. It did not say how many U.S. jobs it will cut. The owner of Olive Garden and Red Lobster says it won't bump any current full-time workers down to part-time status, after its tests aimed at limiting health-care costs resulted in a publicity backlash that took a bite out of sales. At the same time, Darden Restaurants Inc. isn't ruling out relying more heavily on part-timers over the long haul. The new health-care regulations will require large companies to provide insurance to full-time workers starting in 2014. Another Starbucks may soon pop up on a corner near you, as the world's biggest coffee company plans to add at least 1,500 cafes in the U.S. over the next five years, boosting its number of cafes in the country by about 13 percent. In economic reports Wednesday: U.S. service companies grew at a slightly faster pace in November, The Institute for Supply Management said. And orders to U.S. factories rose modestly - 0.8 percent - in October, the Commerce Department said.